More Top MTB Trails covers over 100 routes in the Free State, Gauteng, KwaZulu-Natal, Limpopo, Mpumalanga and North West provinces. MapStudio’s new release, More Top Mountain Bike Trails, covers over 100 routes in the Free State, Gauteng, KwaZulu-Natal, Limpopo, Mpumalanga and North West provinces. The book focusses on 31 top trails with detailed mapping including GPS co-ordinates of the start point, 63 other recommended routes and 49 minor trails. Six of the top routes in Botswana, Lesotho and Swaziland are also mentioned. Each trail has up-to-date route information, GPS co-ordinates, great photographs, and all contact details, along with African Mountain Bike Association (AMA) approval where applicable. An overview map of South Africa at the beginning of each section pinpoints all the trails. This is a great book for experienced as well as aspiring mountain bike enthusiasts, and the perfect companion to Top MTB Trails, which covered the three Cape provinces. 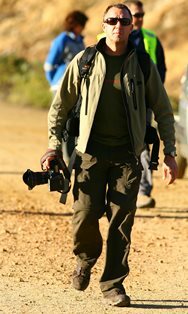 Jacques Marais is a professional photographer, photojournalist and author who primarily focus on adventure travel, extreme sport and the great outdoors. He regularly contributes to a wide selection of premium adventure, travel and outdoor lifestyle magazines and newspapers, both in South Africa and abroad. Jacques has authored and contributed to more than a dozen outdoor and adventure guides, covering activities as diverse as mountain biking, trail running, hiking and adventure racing. Awards include selection as a TOP 50 Finalist in the acclaimed ILLUME Red Bull Photographic Competition, as well as Gold and Silver Certificates in the respected SONY Profoto Awards. When Marais isn’t traveling to the most remote corners of the globe, he explores the Cape Peninsula trails with his wife Karyn and three kids – Beth, Robert and Grace – on their bikes or on foot. Be the first to review “More Top Mountain Bike Trails” Click here to cancel reply.